Today the recipe that I am going to share is not mine but my Mom's recipe. Though she is more famous for her soft and stuffy paranthas in my family but this time she tried something new, the Coconut ladoo. Since we moved to Bangalore, my mom has made few friends who are south Indians and she has been learning few things. And coconut is available in abundance here. My kids love sweets and she made is especially for them. I used to think making desserts or sweets is really difficult and complex but more I have seen my wife make those wonderful desserts like Bread and Egg Pudding, Tutti Fruity Cake and Mocha Mousse, I now know how easy are these. Do check out these recipes too by clicking on the name. So this is how the amazingly tasty coconut ladoos look like. 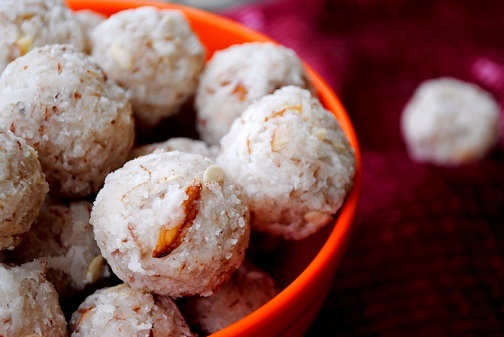 So, here is the simple recipe for mouth watering Nariyal Ladoos. First of all, mix the grated coconut, sugar and almonds in a bowl and keep it for 1 hour. Now take a wok or kadhai and heat it on medium. Add the mixture and roast it for 25-30 minutes stirring in between. Once it starts to stick a little, take it off the heat and let it cool down. 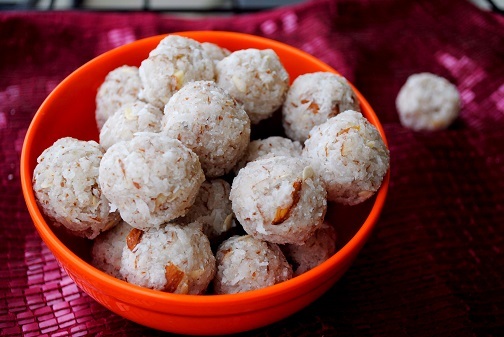 Once cool, wet your hands with water and start making round balls or as we call the ladoos. Your Coconut or Nariyal Ladoos are ready. Store it in airtight jar and enjoy one ladoo at a time. Just saying because it is sweet. Do leave your comments below about the recipe or if you have any questions. Growing up in a punjabi family, one of the staple curries that I would eat is Egg Curry. And I used to love the way my mom will make it. I still do. But then there are things you take for granted and it is the same with me. Being busy in making those fancy dishes like Chicken Korma, ToumChicken, Hummus, Piri Piri Chicken and many more, I never tried my hand on this really delicious Egg Curry. I remember enjoying the hot serving of Egg Curry with hot chapatis directly off the tawa in chilly Delhi winters. Trust me, when you are hungry, this simple thing is heaven. Imagine me and my siblings fighting for that extra egg in our curry. Being the youngest I will get it too.! So, I decided to get into the kitchen and try my hand on it. It actually is a lot like other North Indian curries and very simple. You can also do some variations in it. I just make the basic one but I will tell you about it. Here is the humble Egg Curry. Let me tell you how to make Egg Curry. 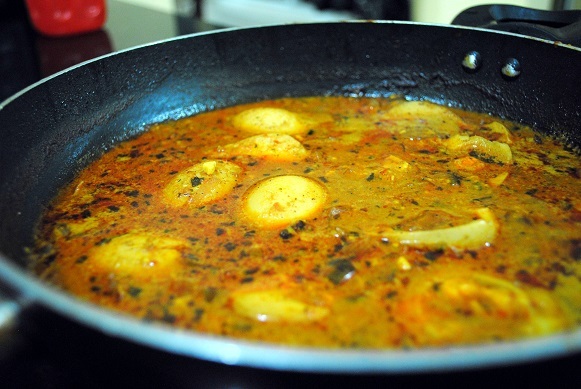 Egg Curry is made using simple spices used in normal curries in north India. It is really liked mostly in northern part of India. Hard boil the eggs and peel them off. Finely chop the onions, chillies and tomatoes. Heat oil in a pan or kadhai. Add the onions and green chillies and cook for 2-3 minutes till oil separates. Now add Ginger-Garlic paste and cook for 2-3 more minutes. Now add all the spices except garam masala and cook till oil separates. TIP: keep adding little water while it gets cooked to ensure it doesn’t stick to the pan. Now add finely chopped tomatoes and cook them for another 3-4 minutes. Now the variation part. 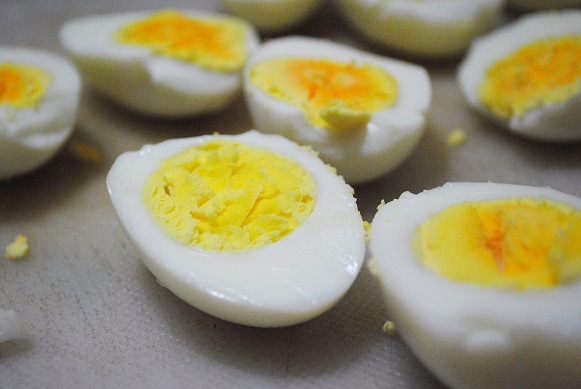 You can either put whole hard boiled eggs or cut them into halves. Another things that you can do is so deep fry whole eggs. I love this one. Now put the eggs in the gravy and cook for 1-2 minutes. Add little water as per your preference of thickness of gravy and cook till oil starts separating. Another trick that I love. Take out yolk from 2 boiled eggs and mix it in the gravy. This will make the gravy thicker if you like it that way. Just when it is done, add garam masala and garnish with chopped coriander. Now you can actually thank me for this Egg Curry Recipe. I hope you liked it. Do leave your comments below and rate my recipe too. Your feedback is really valuable to me. It seems like I have been gone for eternity and I know it is true that I have not been posting for a long time. That is because I have not been cooking. Have shifted to Bengaluru and I have been staying on office accomodation for months but now my playground (kitchen) is all set and I have already started. So, here is my first post from the new kitchen, but one of many to come from Chicken Shicken. Last Saturday, I went into the chicken shop and got one whole chicken to make Pot Roast Chicken which you can see on my blog but then I also picked up some chicken liver, kaleji as we fondly call it in north. :P And why do I call it Litpit? Well, because neither it is dry nor it has gravy. All the masala is covering the liver. And like it happens, I mostly cook very impromptu dishes which are easy to make and delicious too. This Litpit Kaleji is one of them. Perfect to go with drinks (Now that is what I love doing on weekends). I never knew that such a simple 15 minutes thing could be so easy and simple. 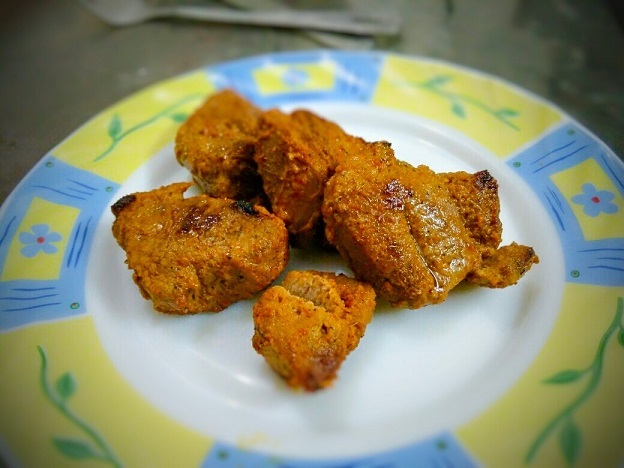 Now yesterday I posted my blog regarding recipe of Adana Kebab which I made along with amazingly soft Butter Naans. I have been getting requests for recipe of Butter Naans and especially to how to make them without oven or say in Pressure Cooker. Yes, that is how I made them, in your humble Pressure Cooker. It just clicked me on the go because I do not have an oven, I have a microwave with convection which off course does not do the job of a typical oven. So, my innovative mind thought of trying just one naan in pressure cooker and then actually, I made them all in it. Today, I had it with Dal Makhani. But then they say best marriage of Butter Naan's is with Butter Chicken. Check recipe for Butter Chicken here. Off course, equipment if not the only thing here, the dough is super important too. What goes in the dough makes it super soft. There are certain dishes like Chicken Korma which are so usual in our orders when we go and eat outside in Indian restaurants that we end up taking them for granted. However, this specific dish is very close to my heart because of its texture and mild though flavorful taste. I have made this at home so many times and yesterday I realized that I have not shared it with you lovely people. What a shame! But better late than never. Finally, look at the pics. There is another dish that you might want to try which is Spicy Mutton Korma. This one is spicy whereas this chicken korma is mild. Anyway, enough of self praise, here is the recipe for you. 1 tea spoon garam masala. Recently I have gained some knowledge about Hyderabadi cuisine and been making an effort to try them. Hyderabad is really a house packed for meat lovers and I am a strict meat lover. 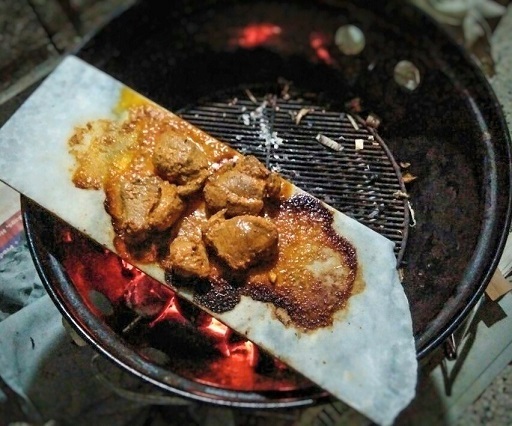 When someone suggested to me that I make Pathar Ke Kebab, I was fascinated by this unique way to make kebabs. Kebabs cooked on stone slab, as the name suggests, are done so quickly and add a unique flavour. Just the cooking process makes it interesting. Though mutton takes longer to cook but I guess the marination and the method of cooking made it really tender in short time. It was an improvisation of a chef of a Nizam who would demand delicious mutton (goat meat) kebabs while hunting in the woods. The chef burnt some charcoal, put a stone slab on it and cooked some kebabs over it and then it became a famous dish in Hyderabad. In hyderabad it is done on unpolished granite but I had a long marble slab which I used. Idea is to cook on stone. Let me get straight to the recipe. Pathar Ke Kebab literally means Kebabs cooked on stone. It includes heating stone over charcoal and then cooking meat on it. 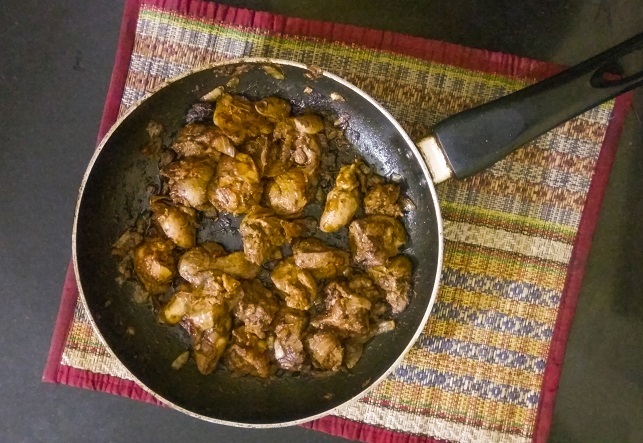 Recipe for Mutton Badam Pasanda or How to make Mutton Pasanda. So after some gap, I am back and that too with a bang with a dish which is my fixed menu when I visit Karim's in Old Delhi near Jama Masjid. There are few things that I get fixated to like this dish which is called Badam Pasanda in Karim's menu and one of my shoes which I can't seem to discard even though they are totally worn out. Well, not that I have not ordered new shoes but still I still fixated to my old ones. Badam Pasanda is so delicious and rich that anyone can get hooked to it. Once you try it, you will know I am fixated to it. And also, Ramzan is round the corner and this had to be the dish that I would try. Even Haleem is on my mind. Few more recipes you can cook during Ramzan are given below. I was planning a visit to Karim's this Friday but had to cancel it due to dinner with my boss. But then I wanted to have taste of this dish in my mouth. And obviously, I had planned to make this dish for sometime and finally I got the urge and opportunity to do it. Let's get to the recipe now. Bonless strips of mutton cooked tender in exotic Indian spices. Boneless mutton from goat thigh cut into thin strips. 750 grams. 1 and half tablespoons whole black pepper.